The Chicago Fire celebrate one of their second half goals. USA Today Sports. 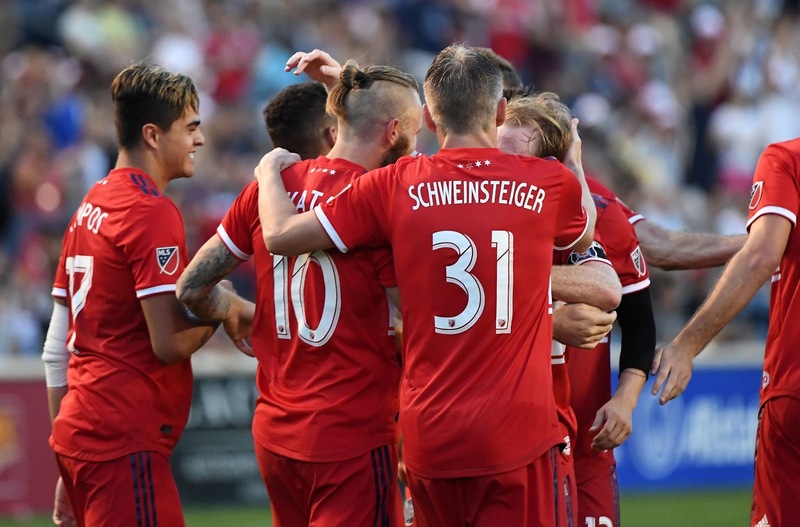 The Chicago Fire scored two in the second half to outlast New York City Football Club, 3-2, on Saturday night. NYCFC dropped to 9-4-4 on the season, in second place in the Eastern Conference. They are now six points behind Atlanta for the top spot in the east, and just one point ahead of Columbus and two points ahead of the Red Bulls, who play in Toronto Sunday afternoon. NYCFC hosts the Red Bulls next Sunday, July 8, at Yankee Stadium. The Red Bulls have won both Derby matches between the clubs this season at Red Bull arena, one in MLS play and one in the US Open Cup. Chicago got on the board in the sixth minute, as Dax McCarty cut through the center of the NYC defense with an incisive pass, allowing Nemanja Nikolic to streak clear and get one past NYCFC goalkeeper Sean Johnson . NYCFC responded as the first half wound down. In the 36th minute, Maxi Moralez found Ismael Tajouri-Shradi on the top of the box, and he fired a shot that swerved away from the goalkeeper into the bottom corner. That goal tied Tajouri-Shradi with David Villa for team top-scorer with eight goals in 2018, a great start to his first year in MLS. In the 40th minute, Jo Inge Berget, on a feed from Anton Tinnerholm, fired one into the opposite corner of the net to make it 2-1 NYCFC. For Berget, this was his fourth goal of the season, and comes after he had two last weekend against Toronto at Yankee Stadium. It stayed that way at halftime, but it didn't take long for Chicago to respond in the second half. Aleksandar Katai tied it in the 47th minute, after a feed from McCarty, on a shot that first curled around Johnson from the edge of the box, and then in the 53rd minute, he got around NYCFC defender Alexander Callens and fired a rocked in net to make it 3-2. This was NYCFC Head Coach Domènec Torrent first match on the road after winning his opening game with the team last Sunday against Toronto. “I mean we have to pick ourselves up, it’s my job as well as a leading player to do that, all the players feeling we have nothing to be ashamed of. I think we had a big chunk of the game today, we just conceded stupid goals but I mean that’s football, that’s life and it’s nice to get a chance to wipe the sheet clean next week against the Red Bulls.